What is the difference between a psychiatrist, therapist, and coach? When I first looked for a therapist, I was very confused about what type of provider to search for and what all the different acronyms mean. 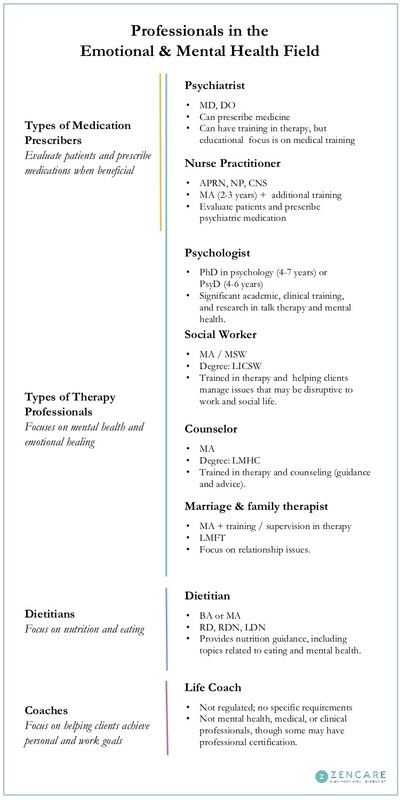 This is a quick guide to help you determine where to start your therapy search by provider type! The highest level decision to make in your therapist search is what kind of service you would benefit from most: psychiatric medication management, talk therapy, nutrition guidance, and/or life coaching. Psychiatrists are medical doctors who specialize in the diagnosis and treatment of mental and behavioral health disorders. Psychiatrists evaluate patients and prescribe medications when beneficial. 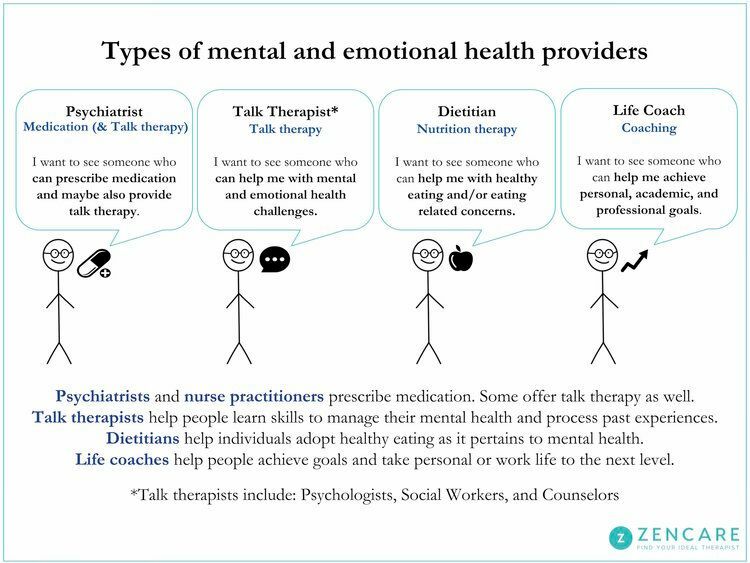 Some also provide weekly talk therapy and if they do, they can be the most expensive of the therapy sessions; however, combining medication management and talk therapy allows for highly coordinated care and a psychiatrist who knows your situation very well before prescribing. Nurse practitioners can also prescribe psychiatric medications. Therapist is a broadly used term for professionals trained in psychological and emotional issues, including psychologists, social workers, counselors, and marriage and family therapists. While some licensures require more educational and training experience, all mental health professionals are trained in some form of talk therapy, and there are outstanding therapists at every licensure level. The most important factors to prioritize in a therapist search are personal fit and the progress you make with them. Dietitians provide nutrition guidance, but not typically do not have additional training in psychotherapy. They may specialize in topics related to eating and mental health, such as eating disorders, overeating, non-diet approaches to wellness, and preparation for and recovery from bariatric surgery. They help clients set goals and provide support while monitoring progress. They have completed a minimum of a bachelor’s degree and supervised experience.